Hi, I'm Rutger, 26 years old Amsterdam lover with a high interest in photography and music! Want to know more about us (or me) send an email to rutger@overdose.am! YEW! 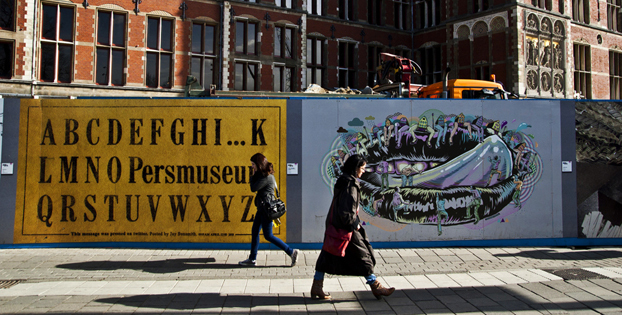 It’s hard to miss all the art decorating the construction fences around Central Station, which has been on display since March 2009. Edits, a temporary exhibition, is the result of a collaboration between the local authorities of Amsterdam and N8. The concept behind the exhibition is that the works of art each represent one of the great museums Amsterdam has. Young designers and illustrators make them and get the opportunity to present their own interpretation of a museum. There is space for eight more new artworks! On March 15th 2011, the last round of submissions for Edits was launched. You as a young designer make a chance to be exhibited at Central Station! The assignment is to take something of a museum as the starting point of your design. This can be an object from the permanent collection, the building itself, or it can be a translation of your personal vision of this museum. The jury (consisting of Nalden, Geer Oskam and Arne Hendriks) asks you for a portfolio of previous work and your design proposal. Tip 1: Visit the museum in advance so you can explain your concept well. (N8Edits offers you the opportunity to follow a special tour or to meet the curator of one of the participating Museums. Of course you can also get extra information and images of every museum so you can start your Edit with more knowledge). Tip 2: Choose a museum that you don’t know, because there will be much more competition for the popular museums. So, study the conditions, design your Edit before April 11th and maybe thousands of people will see your work!